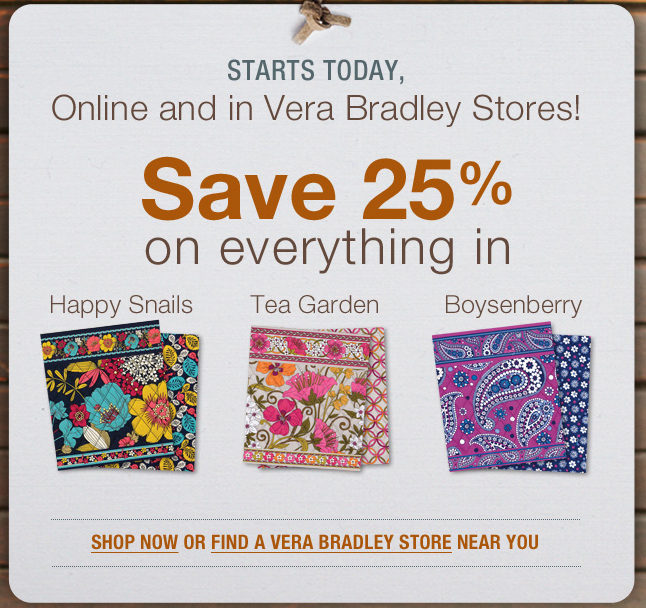 Vera Bradley retired three colors this last week. 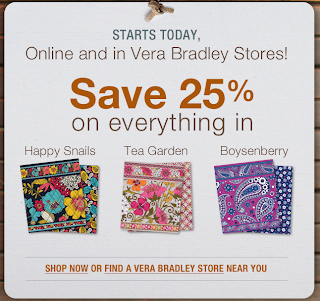 Happy Snails, Tea Garden & Boysenberry are now all 25% off in stores and online. Rumor is that Vera Bradley will also be retiring five more colors right before Thanksgiving and those will be: Very Berry Paisley, Rosy Posies, Floral Nightingale, Mocha Rouge and Rhythm & Blues. Thanks for the heads up, Alison! I'm rather bummed though as Happy Snails, Mocha Rouge and Baroque are my 3 most favorite patters of all time (followed closely by Suzani). At least there are sales to look forward to of these patterns!